This weekend nearby Fraisans is the venue for the NoLogo Festival. Three days of open-air Reggae. I have read about that before, but have put it on the mental backburner. We are painfully reminded of that fact, when at 2 in the night an old lorry pulls up, with an assortment of Reggae fans. They start a bonfire and try to change a tyre, half a meter from Markus’s tent. Myself always has a solid sleep. Other than that Ranchot is still a quiet place when I walk to the little Epicerie on this misty morning. Markus has lost all sympathy for camping in a tent after one night only. 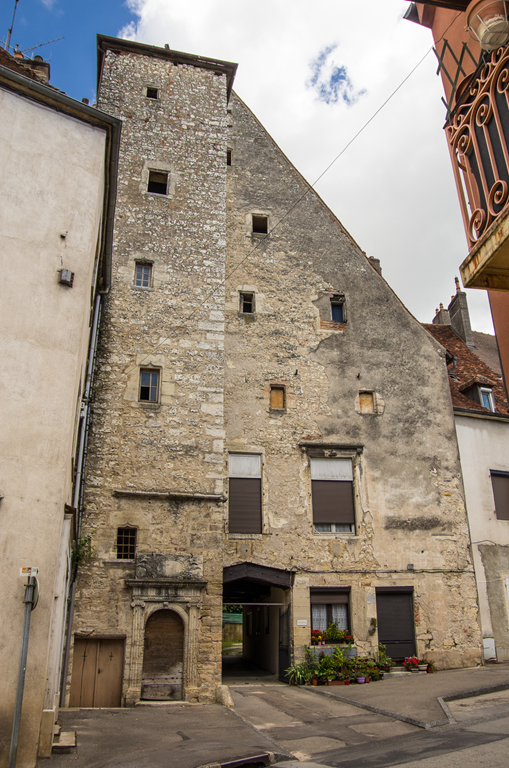 So we set a plan to make it to Besançon, as there sure will be a hotel for a bit more comfort. 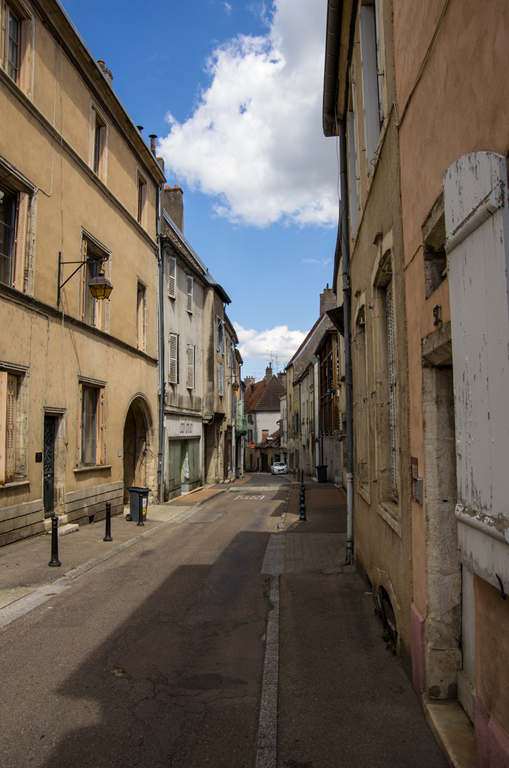 Also Besançon is the mayor attraction of this trip, but will nonetheless be boarded up as any other French town at Sundays. So we set of to a leisurely jaunt up the river. Sophie is made acquainted to the idea of swimming in water that is not tiled at the bottom. 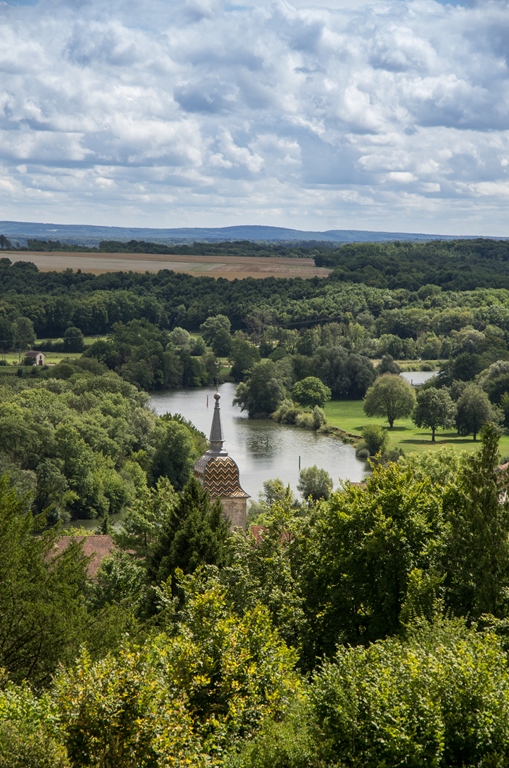 The scenery does get increasingly spectacular, with the Doubs cutting a deep valley through the limestone. The mountains around us are the last foothill of the Jura mountains, which make up the north-western part of the Alps. So in fact, we are climbing up the Alps, in a boat. Damn cool. 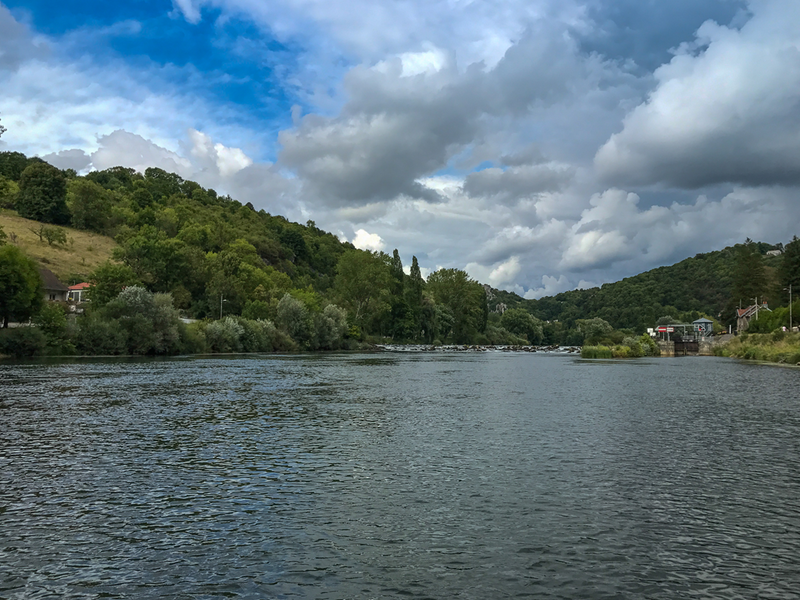 When looking at a topographic map of the area, you can see why they choose this route for a waterway between the Rhone and the Rhine. Although the canal builders at the time had to climb quiet a few meters, this was the logic course. As immediately to the north the Vosges mountain rise up. For lunch we stop above ecluse Thoraise. 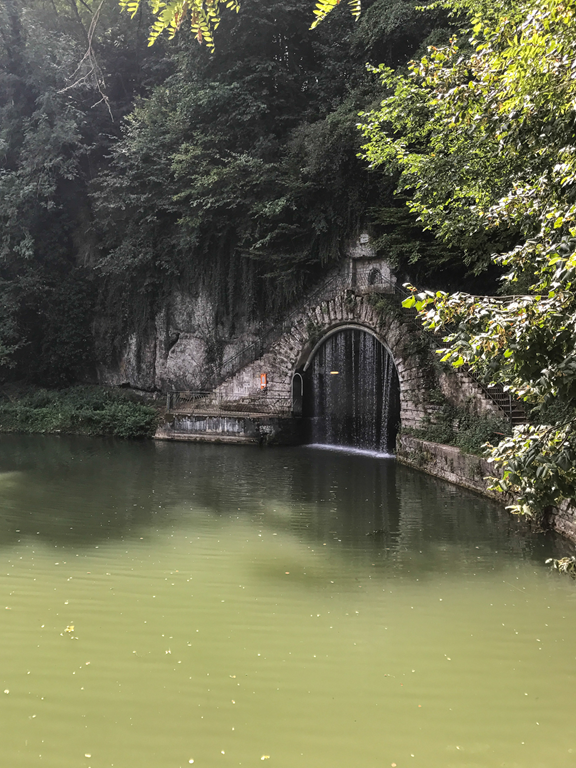 Between the lock and the tunnel (river tunnel, yeah!) is a very nice jetty with all facilities. This would be a nice overnight stop. For now we just make use of the Picnic area. The tunnel also has got art installed on it. Christmas lighting at the ceiling. 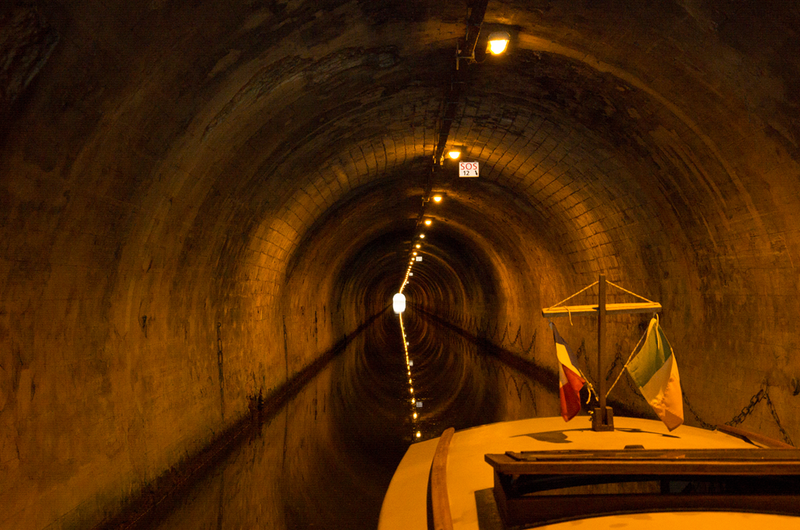 Really cool is the water curtain at the other end of the tunnel, that switches of, just before you cruise through. 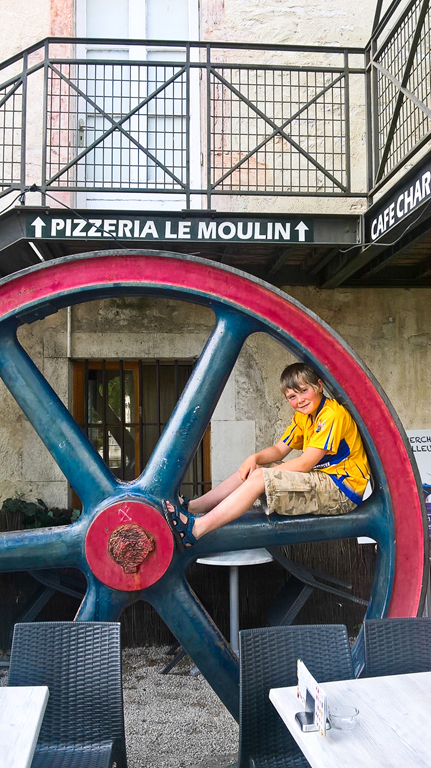 Amidst more scenery stands the huge Moulin d’Avanne. 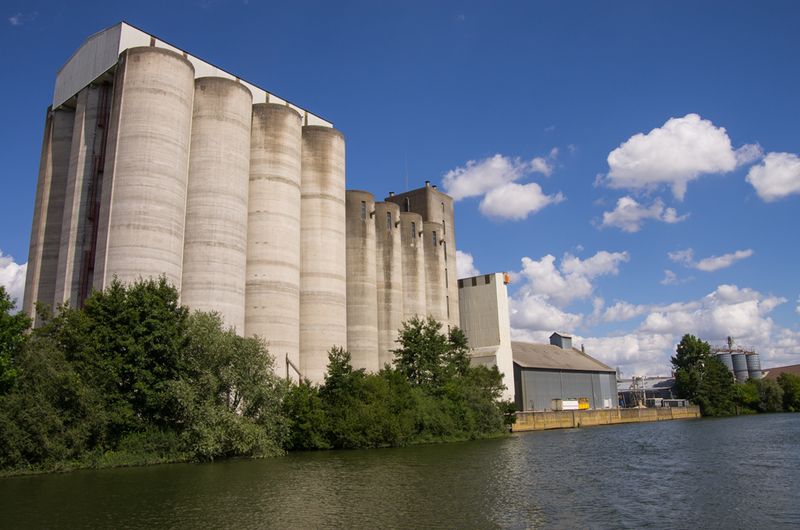 Still in use today, they have specialised on pelleted animal feed. The lock cuts get shorter, with some of the locks almost standing in the river itself. Finally we make it into Besançon. 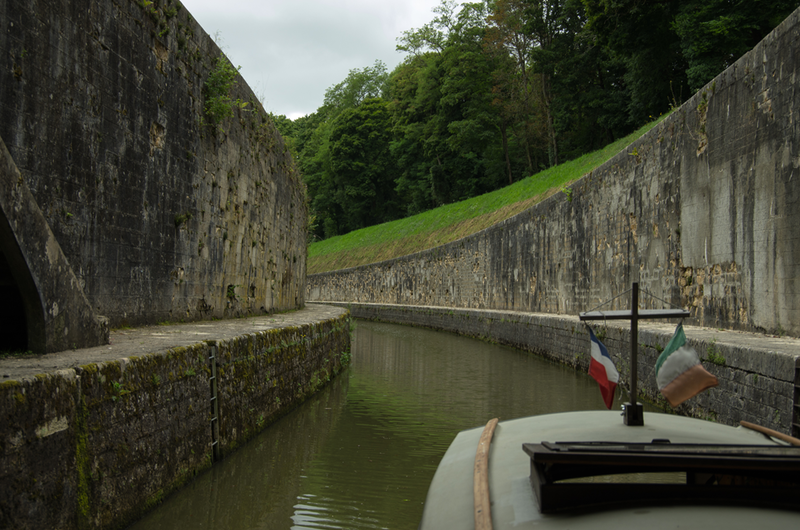 Here the boater can take the Souterrain Tarragnoz, which is cutting right underneath the mighty Citadelle. 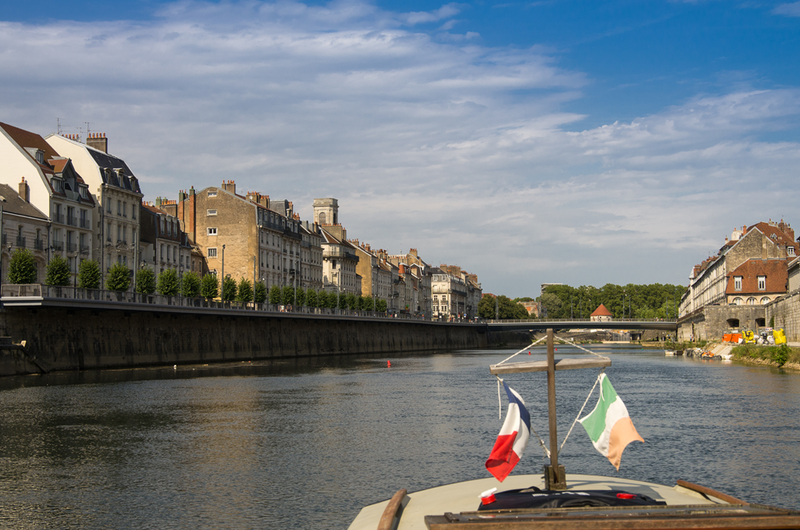 We prefer to stay on the river, that skirts the old town centre in one big loop. Free sightseeing. Markus has booked a hotel room in advance, and he hops of just underneath the bridge in the picture. We should have done a bit pre-booking as well. But being very lucky, we just get the last available space at the Port St-Paul. 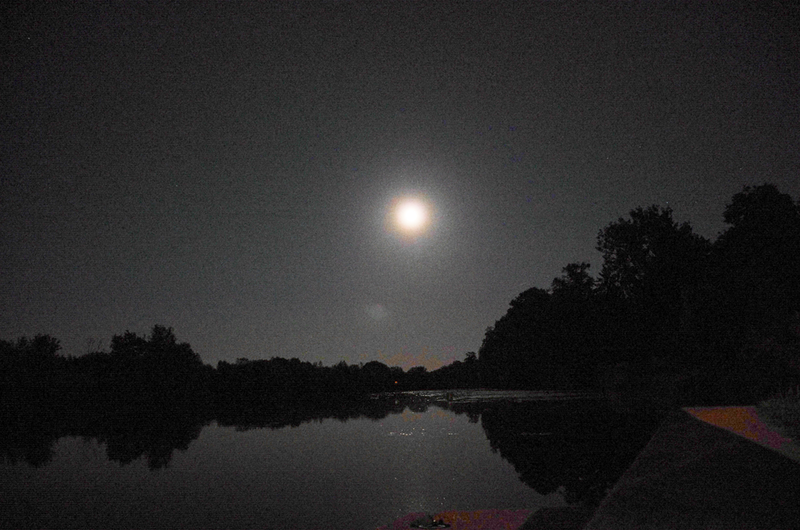 Although it is practically below one of the main bridges into the city, it is a remarkably peaceful place. 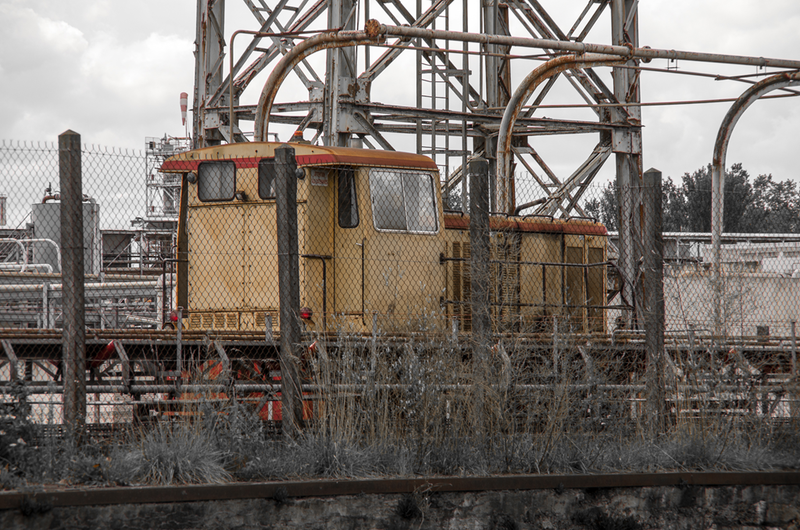 There are hardly any cars, as Besançon has invested big time into public transport, with several brand new railway lines and buses. Very nice. Beyond the port the ecluse St-Paul can be seen. It is the only manual lock on the Doubs. I ask the harbour master for a restaurant recommendation, and he sends us to the La Grange, just a five minute walk away. It is, well, different. It is kind of a themed restaurant, styled like an alpine cabin, clearly pointed at the tourist market. But then we are tourists ourselves , the service and the food are good, although the later follows the already familiar theme of sausage, sausage and sausage filled with sausage. A few nightcaps on board ARGO bring this pleasant day to an end. Today is the day. Two new crew members will arrive and bring with them the new starter motor. But of course it is only a totally unjustified rumour, that Germans always are on time. Just because they are not. Clearly there are worse places to while away a morning than Dôle. 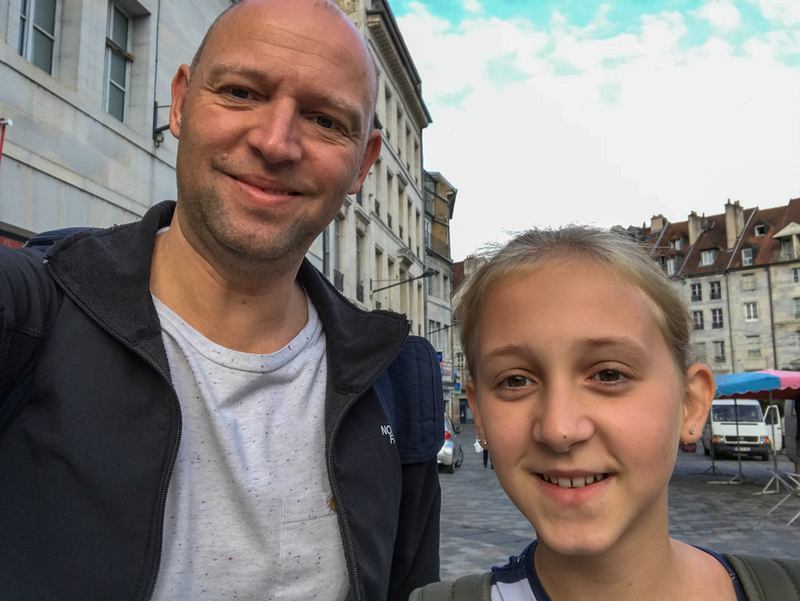 We walk to town, visit the market, buy more than we can possibly eat, sit outside a bar, go back to the market and sit outside a bar. 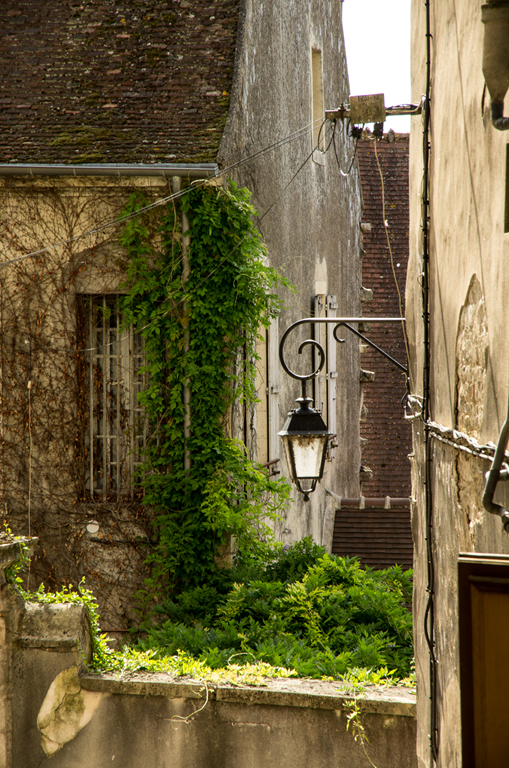 It is noticeable about Dôle, that even the most mundane places are special. 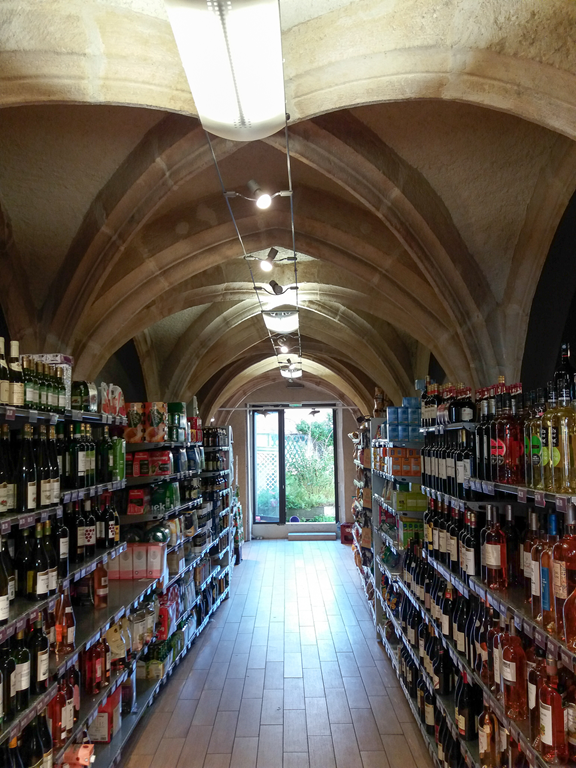 The wine department in one of the local supermarkets. Look at that ceiling. 11.30 comes and the IO’s ex-brother-in-law, we will call him Markus, and his daughter, the lads cousin, lets call her Sophia, finally arrive. Big hello, we get them on board, stow their stuff away and fit the new starter motor. It’s an easy enough job, just three nuts and a few cable connectors. Turn the key, and nothing, absolutely nothing happens. Total silence. The old starter at least made ugly noises. Fault finding shows that there is a 20A in-line glass fuse, that must have broken through a combination of rough treatment and 30 years worth of corrosion. Finding a simple glass fuse should not be a problem, and we trail several car spare dealers in the outskirts with the help of Markus’s car. In the end we got it straight off the shelf at the Giant Casino on the other side of the river. Fuse fitted and success. Great! Then it is back to town for Pizzas all round and a tour of the place. So it is quiet a bit into the afternoon before we start making a move. 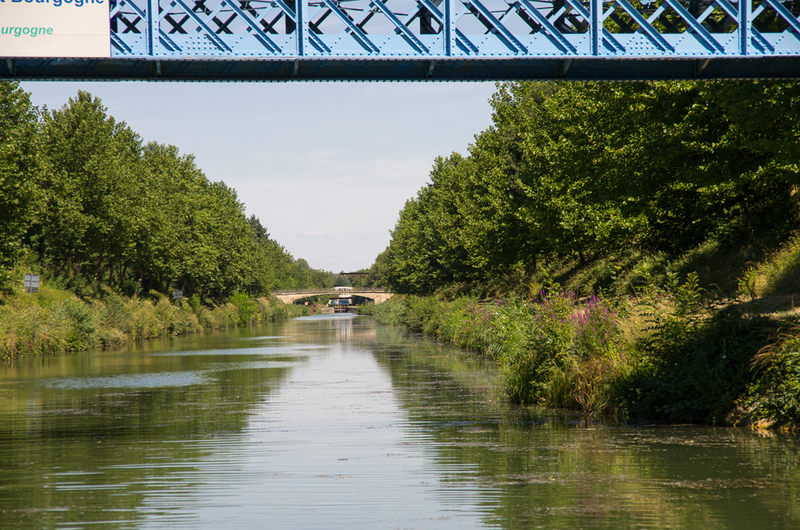 The first stretch of canal past Dôle is stunningly beautiful. 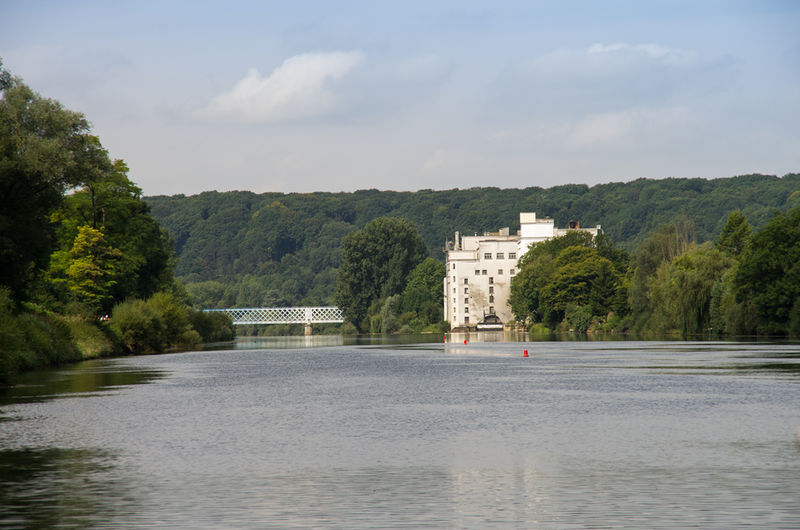 For some reason there is no towpath and the old majestic trees stand either side of the water in perfect symmetry. 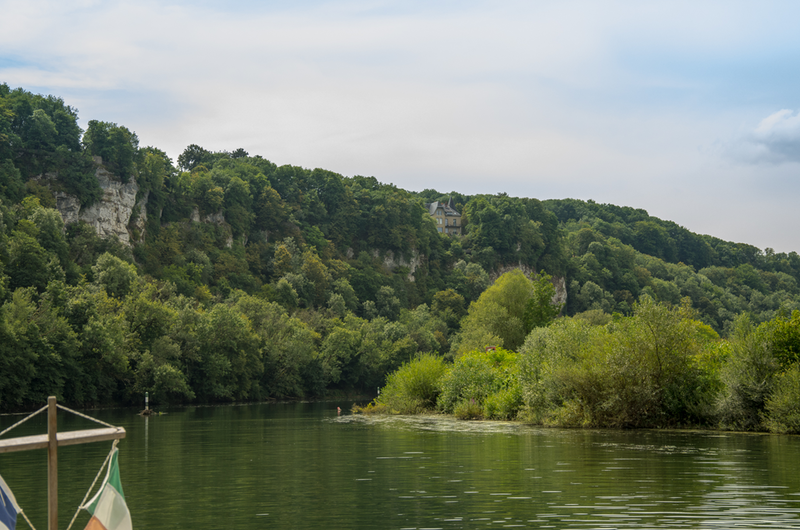 We stop beneath the cliffs at Rochefort-sur-Nenon for a swim, then we press on to Orchamps. The plan is, that the surplus crew will sleep in their tent. Thus it seems more than handy that the Guide du Breil states: “You can moor opposite the camp ground.” Not really. Maybe with a bigger boat. But even standing on the roof of ARGO one cannot reach the top of the lock cut. All we are left with is to rush on to Ranchot, in the hope to find a place for boat and tent there. And indeed we are lucky and reach the last lock 5 minutes to seven. Ranchot turns out to be a rather nice spot. And the young lady who collects the mooring charges allows Markus to put up his tent. Then it gets slightly bizarre. The English (sorry!) crew in the hire boat behind us, refuses to pay their mooring charges. Because they where told their boat is all inclusive. And all French are gangsters, and so one. In short, it gets rather nasty and very loud. Feeling sorry for the young lady , I walk over and offer to pay up for them. It gets even more nasty for a while, but at least they are embarrassed enough to pay up. They draw their curtains and that’s the last we see of them. Picnic tables are provided, we bring out the BBQ, crack a few bottles open and have a good evening. 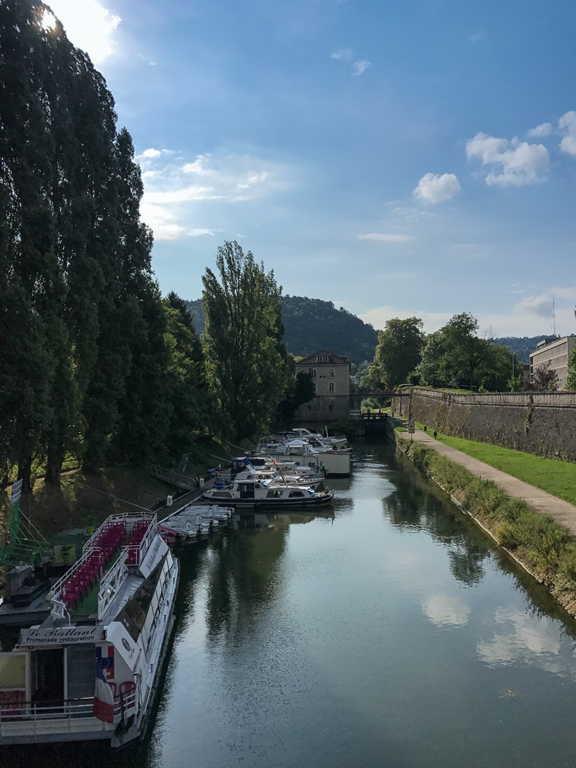 A short run from the quiet spot where we stayed for the night is the entrance to the Canal du Rhone au Rhine. Or to be more precise, its branche Sud. 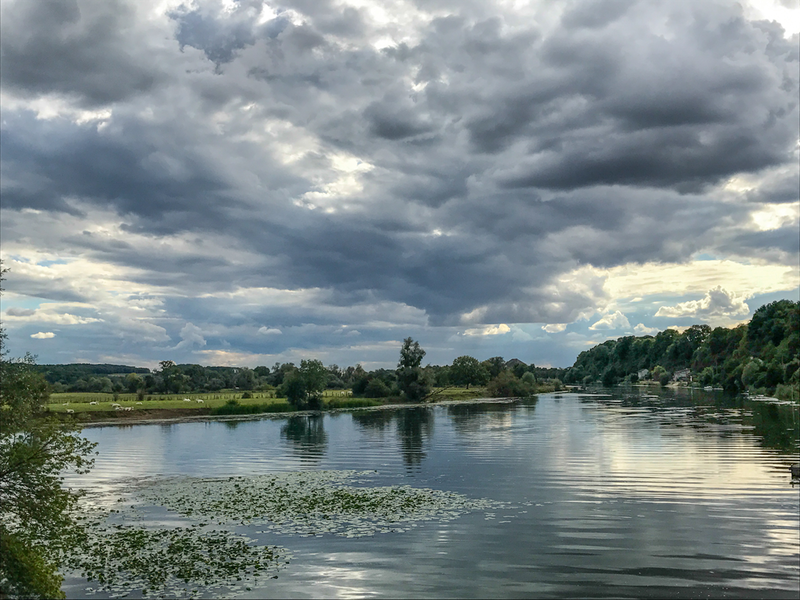 All a bit complicated, but basically, the Canal du Rhone au Rhine consisted of the main branches that meets the Rhine near Mulhouse. 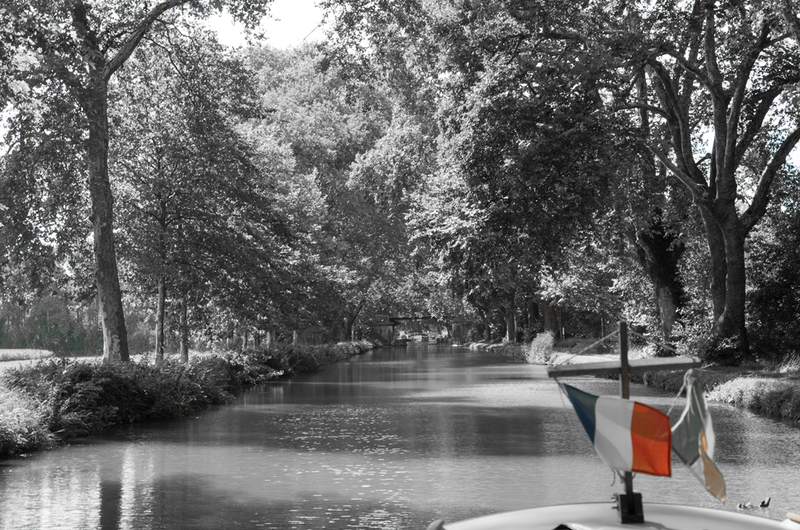 The branche Nord was made obsolete once the Grand Canal d’Alsace, the canalised section of the Rhine was finished. There are a few shorter branches that are mostly in water. But not all of them are in use. 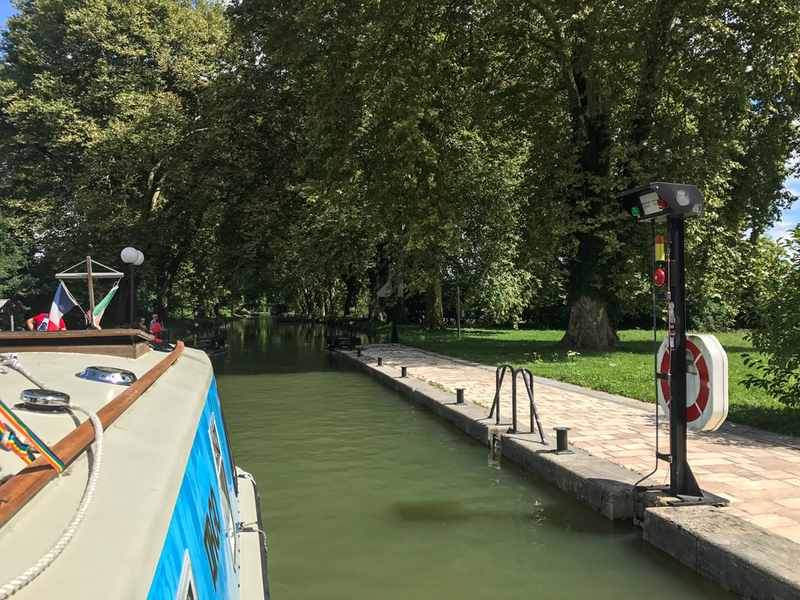 As far as we are concerned, the canal on the western side of the summit (the branche Sud) consists mostly of the navigable River Doubs. 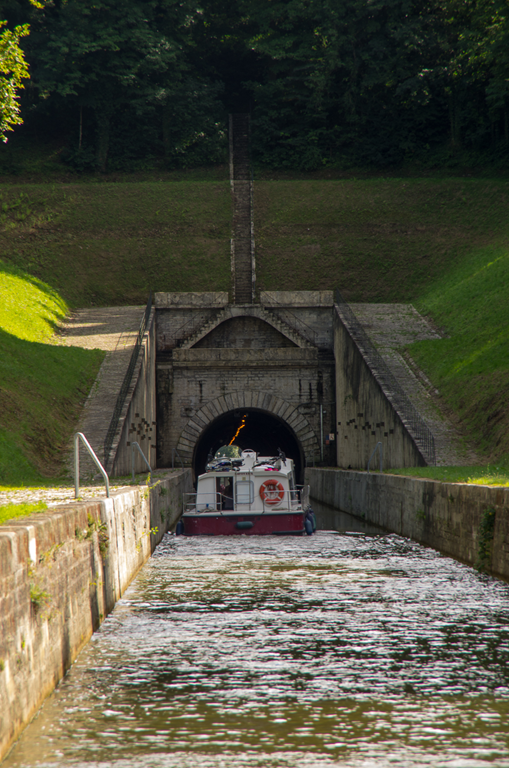 The summit is at a height of 340 m and it takes 73 locks to get there. Quiet a few locks come with substantial lock cuts, that shorten long river bends. Two of them even include a tunnel. More river tunnels! Alas, the first 17km are a proper canal far from the Doubs. 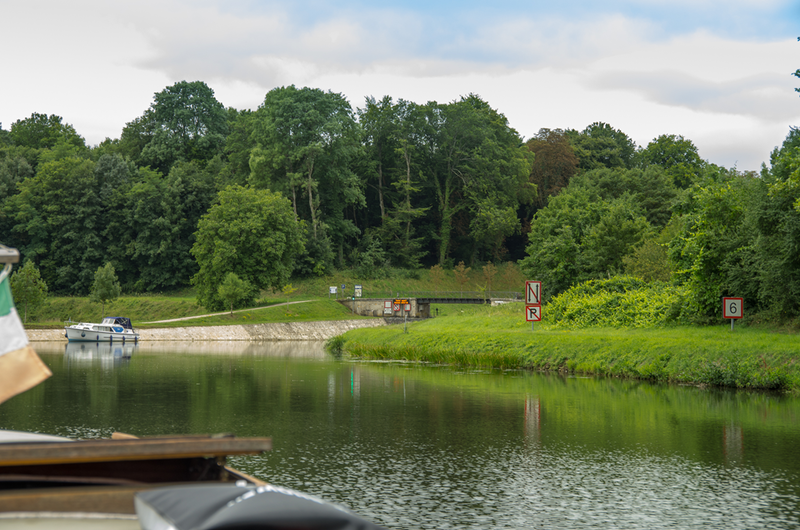 And first things first we have to collect a remote control from the lock keeper at the first lock at St-Symphorien. Quite posh, in theory, you point the remote in the direction of the lock, press a few buttons and the lock should open for you. But more about that later. As it is only a 20 km to Dôle and we should have an easy run. Until the IO checks the water tank and realizes that there is water where there shouldn’t be water. This is: Not inside the tank. 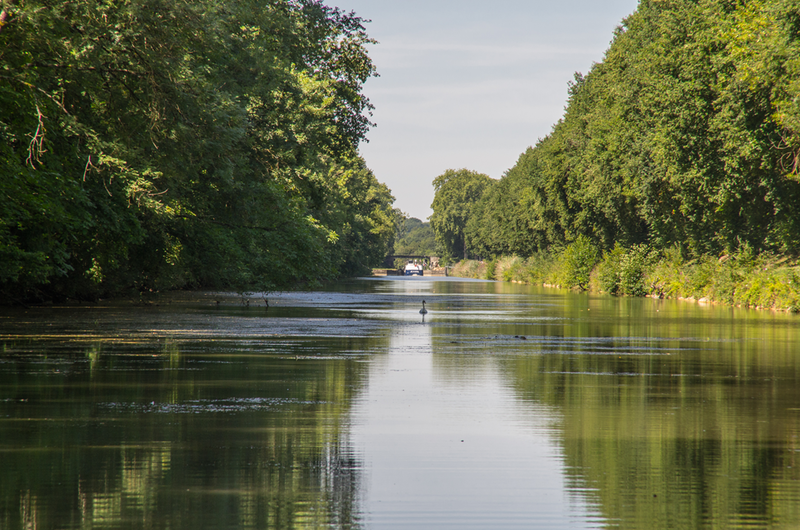 The first part of the Canal winds its way through a beautiful forest. Also I don’t see much of it, as my head is stuck inside the tank locker. At least this is a canal and the IO can be given full responsibilities on the navigation side of things. It’s hard to get lost on a canal. 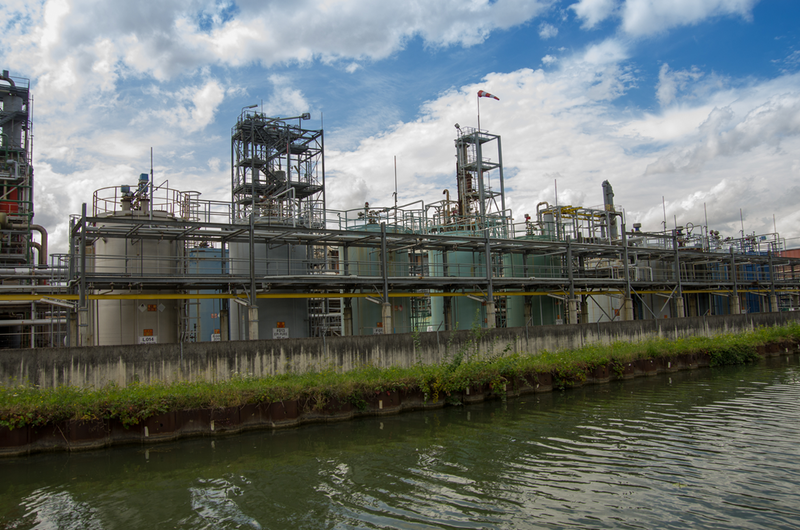 After the scenic bit we pass the Usine Solvay. Signs everywhere tell the boater that he can absolutely under no circumstances stop here and, if orange lights are flashing, it really is high time to move elsewhere. All a bit Bhobal. Dodgy to say the least. Near Choisey the scenery definitely does improve. Arriving in Dôle we fill up the water tank and find that it is holding water. Great. 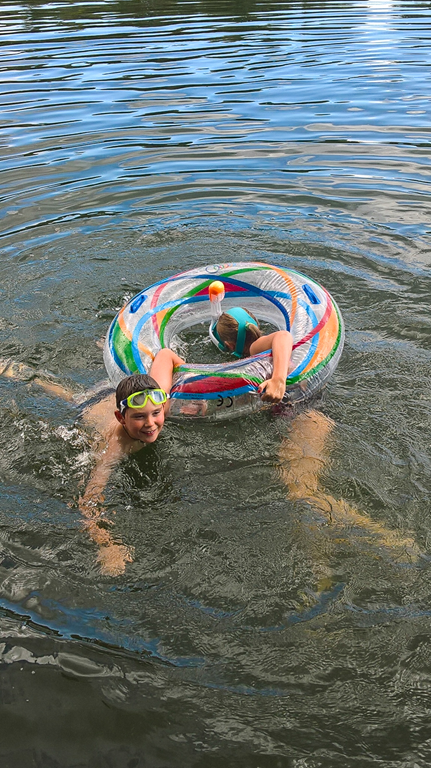 There are extensive moorings managed by a Nicols hire base. At the other side of the canal there is quiet a busy road. But as so often in France, come seven o’clock the place basically comes to a standstill and you can have a quiet night. But now it is time for lunch and we are at the lookout for food. 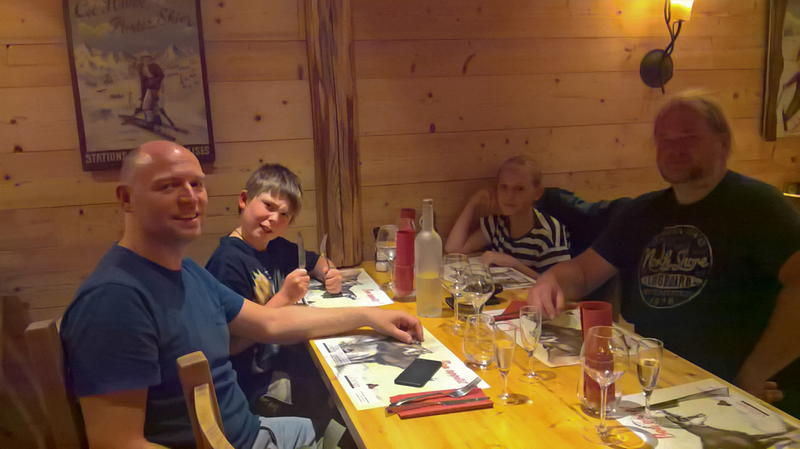 We find a bar that does Tapas Franche-Comté style. Quiet nice, but it confirms the impressions we have got so far. The cuisine of the Franche-Comté seems to consist almost exclusively of sausages, sausages, potatoes, cheese and sausages. There might be several reasons to it. The geographic proximity to Germany and Switzerland. But also the historic fact that the Franche-Comté is only a part of France since 1678. Its nice food, no doubt, but just not quite a refined as in other parts of France. The bar is based in an old mill building. Thus the lad finds a comfy place. After lunch we start to explore the town. And what a truly beautiful town it is. In the middle age Dolé was the capital of the Franche-Comté. 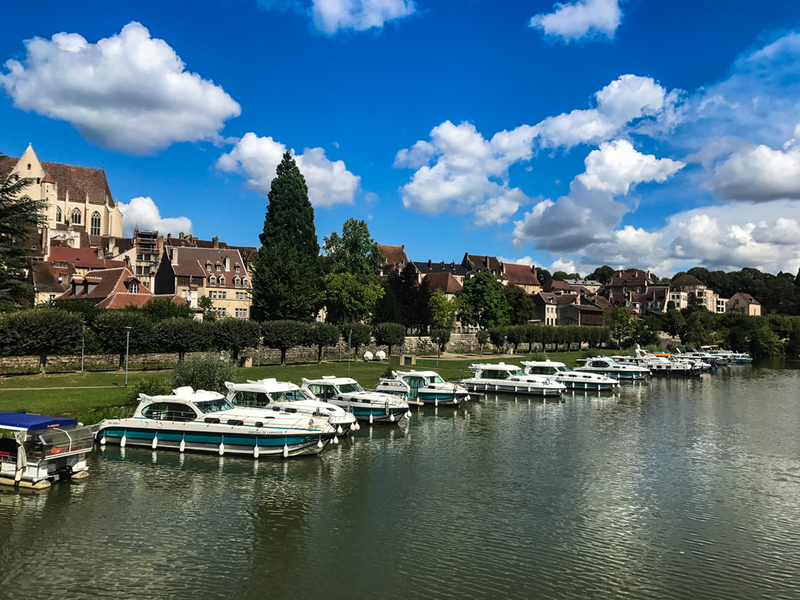 An important city with its own university, which it lost when Besancon became the capital in 1422. 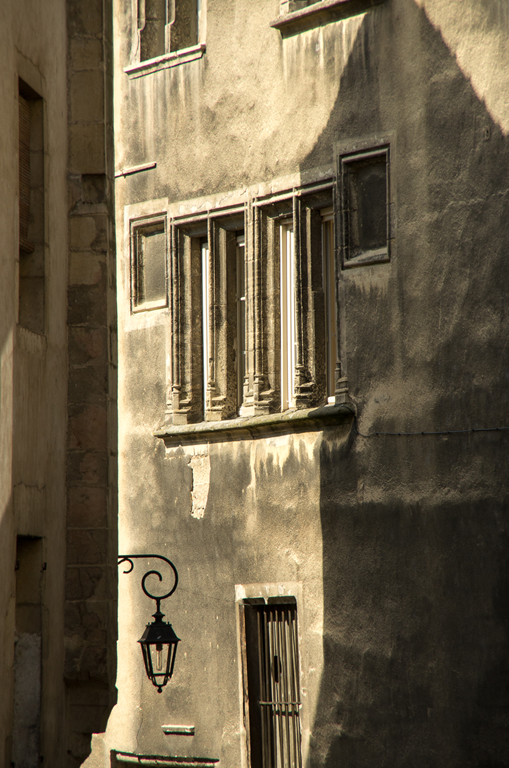 But still it kept the charm of a medieval town. 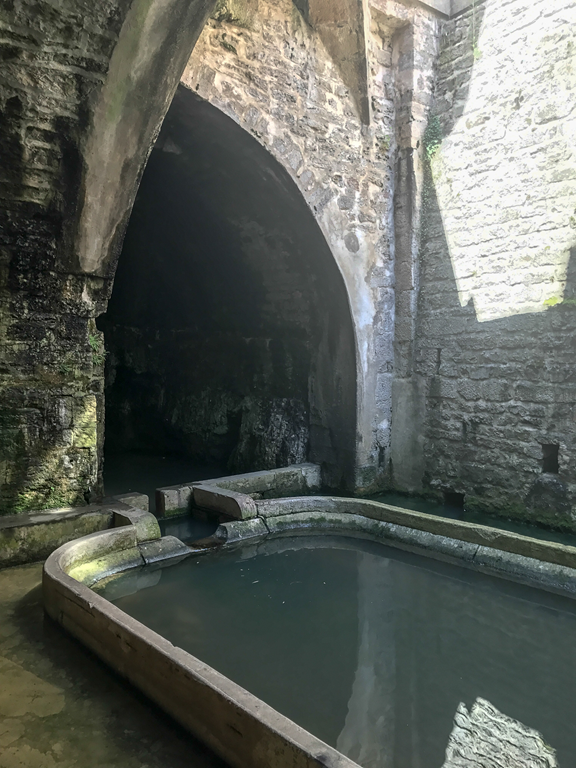 The canal de Tanneurs at the time must have been a miserable place, used by the tanners as a source of water and as a dump for their waste at the same time. Nowadays it is gentrified, but definitely in a positive way. 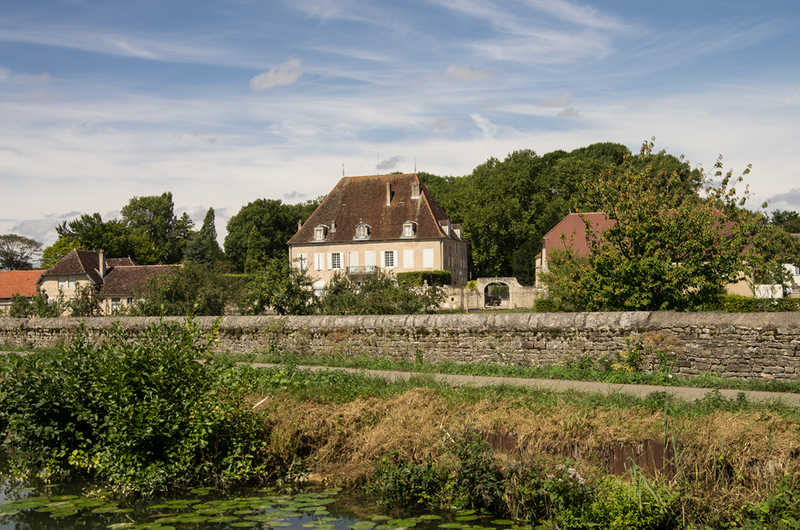 Louis Pasteur, arguably the greatest son of Dolé was born here, as his father although was a tanner. As a biologist he was one of the fathers of vaccinations. And thanks to him, milk doesn’t go off after two days. 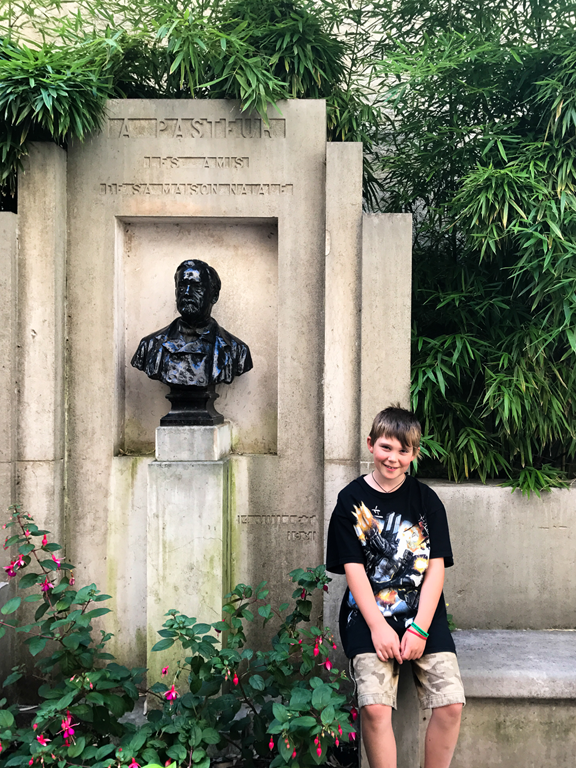 His father’s house is a museum, that shows at least some of his many achievements, and sure enough we paid our tribute to him. 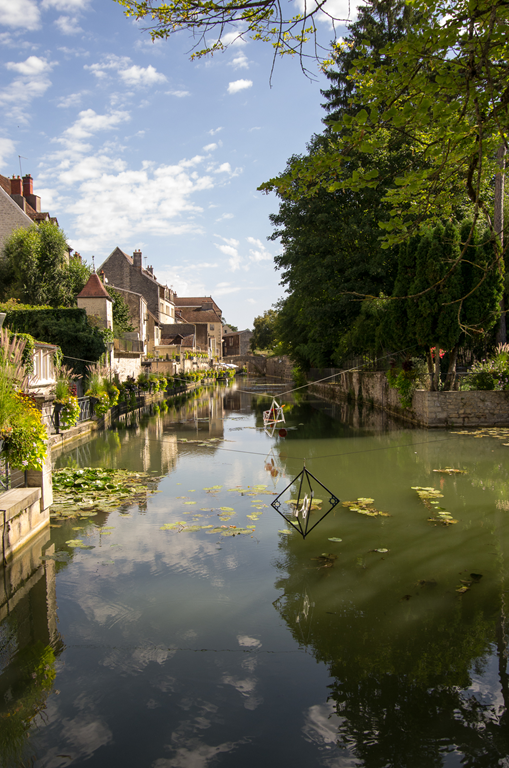 The canal is connected to the city by a souterrain, that contains an old well that supplied the city during a siege. Just a few more impressions from the city. After dinner we decide to have another stroll to town. And as ecpected, come seven at night, the place is dead. But we can hear music in the distance and follow it. And we find an Irish Pub with a hundred people enjoying the balmy night and a band playing songs from the Stones. Always find the Irish Pub. The night was truly abysmal. Torrential rains and thunderstorms. One after the other. The storm started pushing water sideways underneath the roof hatch and water started dripping onto the bed. On my side. Okok, because it is the lowest point of the boat, ballast wise. The thunderstorms stopped around daylight, but the rain kept hammering. 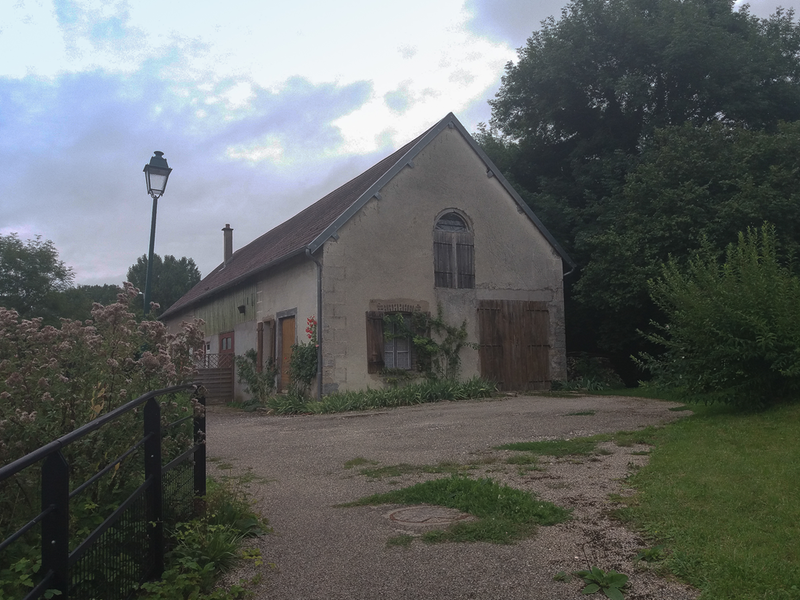 On the other hand there was very little to entice us to stay in Auxonne. Also the logistics of meeting the brother-in-law in Dole on Thursday dictates that we have to make a move. 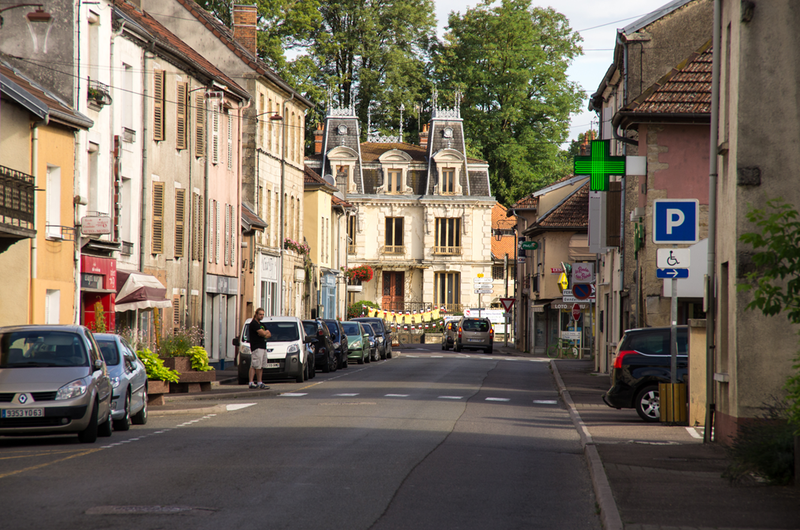 Just after lunchtime we arrive in St-Jean-de-Losne. 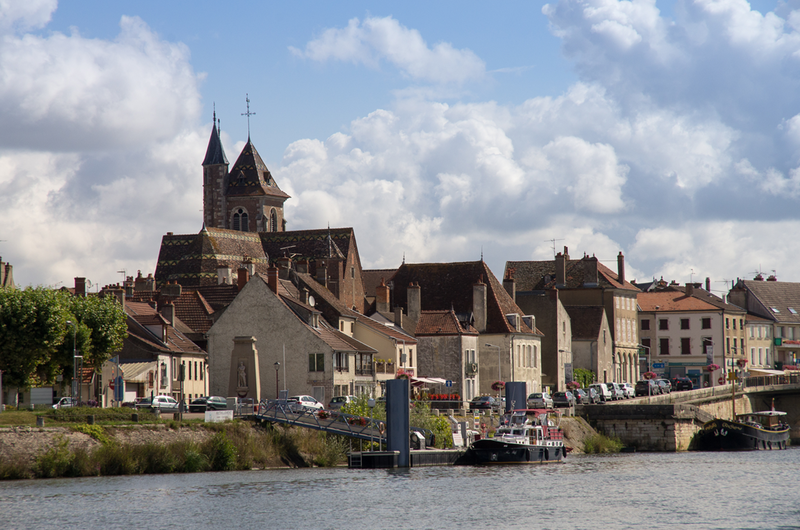 St-Jean is the inland waterway capital of Burgundy, if not France. Six waterways meet here or nearby. 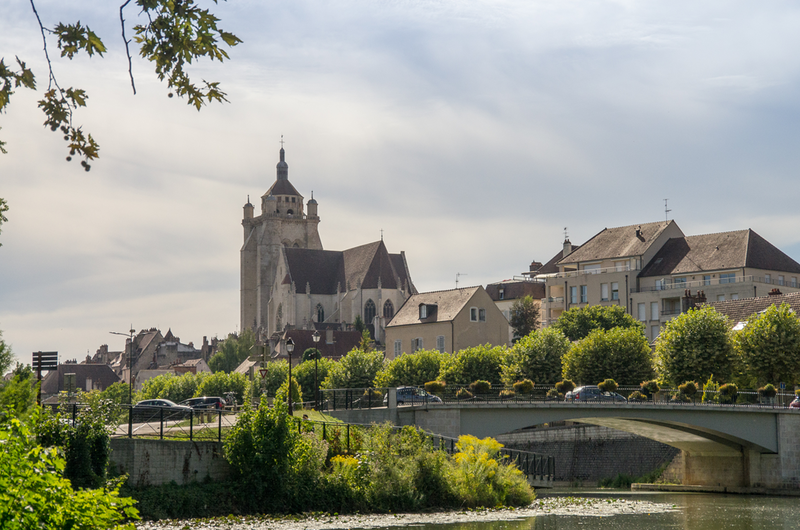 We have just passed the Rhine-Rhone-Canal coming downstream, and the Canal de Bourgogne leaves the Saône right next to the town centre. And this is also reflected by the infrastructure. There is a truly huge Basin, the “Gare d’Eau”. 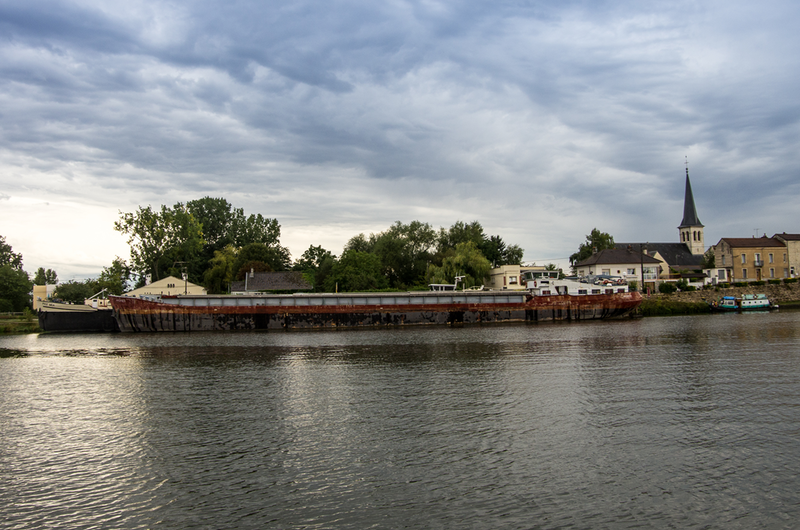 In the olden days used to load barges and to transship cargo from peniches to bigger river barges. Today it is occupied by two of the biggest chandlers/boatyards/brokerages in the country. And the “Atelier Fluvial” by the river still caters for the technical needs of commercial Peniches. 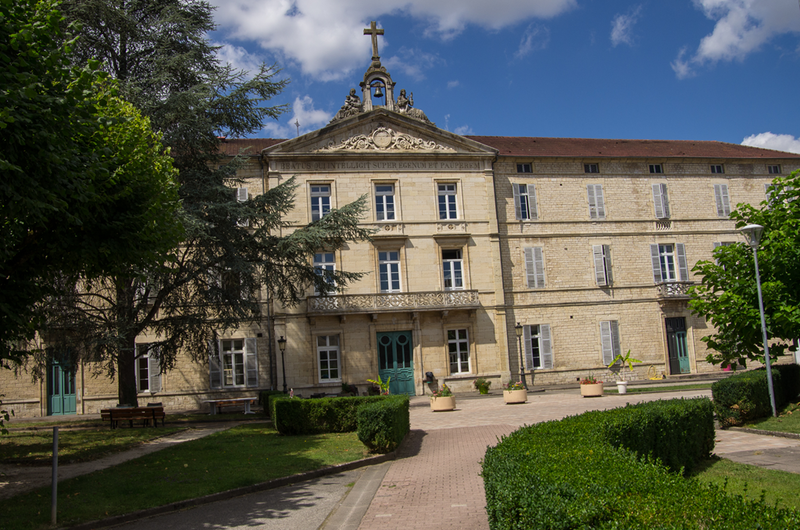 The “Musée de la Batellerie” tells the history and there is even a floating boat filling station on the river. Think Braunston on speed, and you get the impression. Popularity comes at a price. The place is chock-a-block with boats of all sizes. One could use the marinas in the basins. But not only would you need to pay, but you would pay for the privilege of a marina view, i.e. no view at all. Thanks to ARGO’s small foot print, we instead find a space on the 18th century stepped stone quay. We spent the afternoon walking around the basin looking at boats. Pondering which we would like, if we had the money. And the time to use them. And what’s the point of a pool table on a boat? Then it is the museum, rather quaint, but with a large collection of all kinds of nautical, well worth the small fee. It really is all very nice, but after the rough last night, we are in need for a bit more sleep. 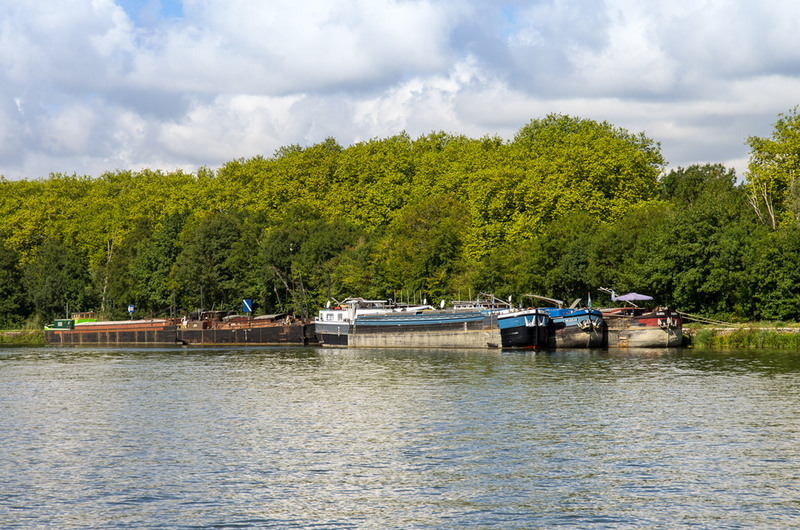 Thus we retire 2 km upstream and find a nice quiet bank mooring near the junction with the Rhine-Rhone-Canal. BBQ, bit of red, reading, early bed. Today is going to be a rather less successful day. The memory card in my camera packs up, it takes me a few days to realize. So I am snapping away happily, but have very little to show in the form of pictures. But it does not start all that bad. The small Epicerie in Mantoche produces some quality bread and we have a relaxed breakfast in more glorious sunshine. 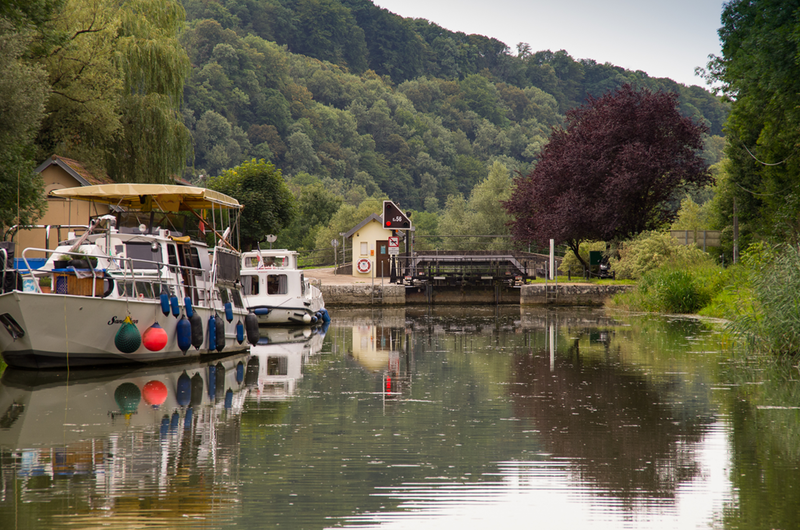 At ecluse Heuilly we run up to a hotel boat, that we will keep meeting over and over again. They are just the size of the lock and it takes them ages to squeeze in. Just before the lock the Canal entre Champagne et Bourgogne joins the Saône from the right. 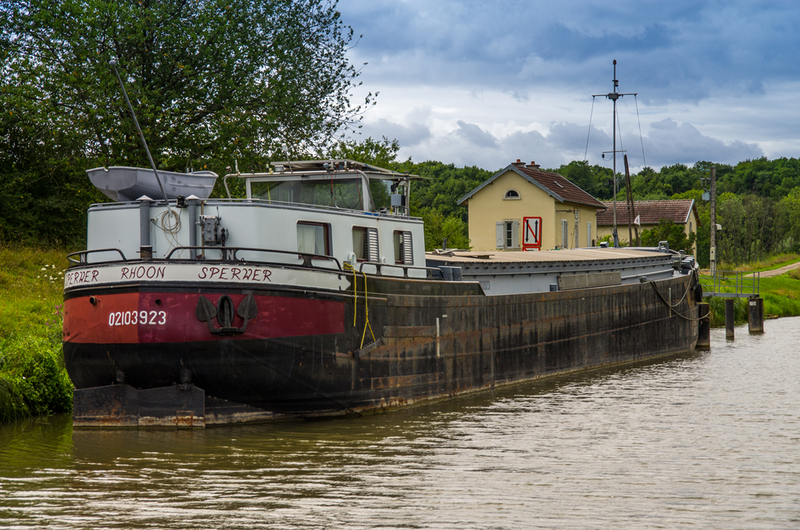 From here it would be 27 km to Dijon in about as many locks in one dead straight line. We give it a miss. For lunch I had earmarked the renowned “Hostellerie des Marronniers” in Pontailler-sur-Saône, which has a very good reputation for fine food along the river. I can’t possibly comment. As they are not open on Mondays. Instead we settled for a place up the main road, cheap, but not cheerful. 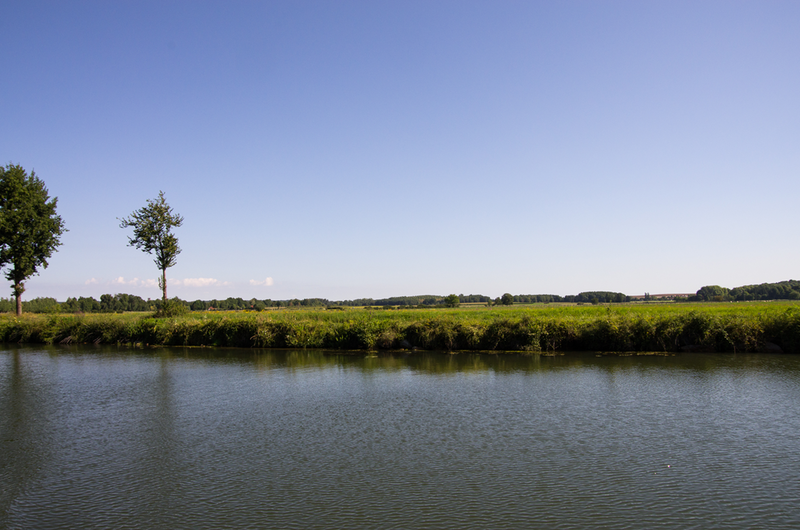 We pressed on towards Auxonne. A bit of a rough place, to say the least. Still very busy with boats. 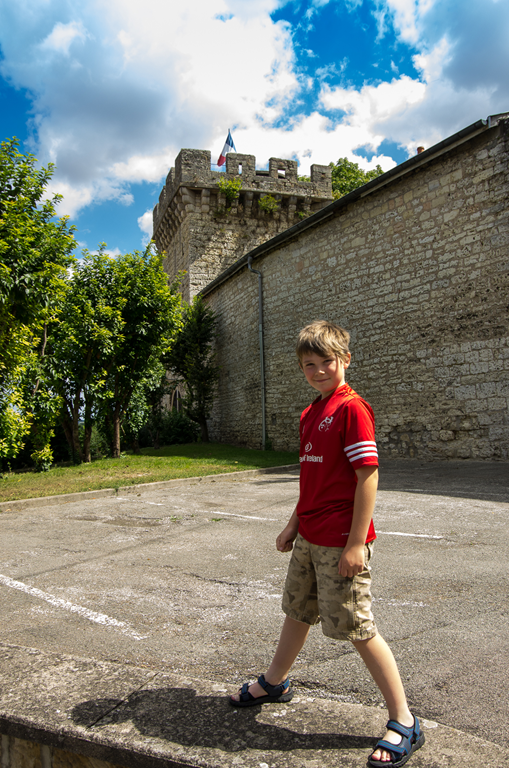 We went to the castle for a tour, but the museum, and thus the castle are permanently closed. Till it might be reopened some time in the future, maybe. At least the super market and filling station are in walking distance and we can do a bit of refueling. While we are having dinner, a whole fleet of sailing boats arrives from downstream and is shuffling for space. We offer a Canadian boat to come alongside, but they are afraid their mast may get into conflict with the boat behind us. Nonetheless the lad has figured, that he can stay up late when we have got guests. So he musters all his bravery and wanders off to invite the Canadians for a sundowner. He comes running back in sheer panic, as he has addressed the wrong crew on the wrong boat. Undeterred Tony and Chih-Ling show up, together with a bottle of wine. As we wouldn’t turn away people that bring their own drink, we sat all down for an evening of stories. They both had a lot of stories to tell indeed. Chih-Ling had fled from Vietnam at the age of three. He ended up in the Netherlands where he has been running a successful restaurant with his wife Tony. Together they have spent the last few years sailing the Mediterranean with their sailing boat. Now they are just coming up the Rhone and are on the way to Holland. Lovely evening. Cheers guys. In glorious sunshine we continue our journey downstream. The first of many grain silos. 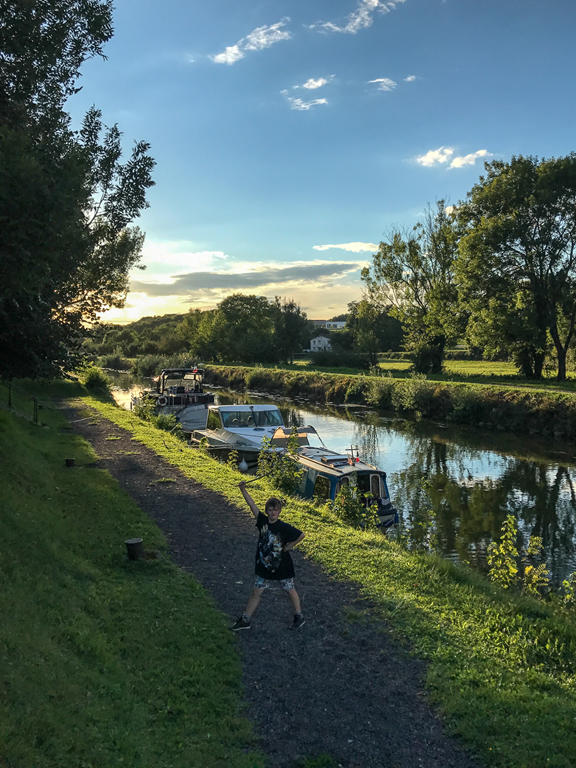 The town lock in Gray is manned by a voluntary lock keeper. Her many jobs seem to be to hand out brochures and a map of Gray. Very thoughtfull. Stipulating local businesses, great idea. Alas it is Sunday and we will find ourselves hard pressed to spend any money. Nonetheless we moor up at the huge stone quay below the lock and wander off into town. The young lad, old walls in the background. We have lunch at a Brasserie near the bridge. Ok, but nothing to write home about. We walk back to the boat and have an extended chat and a glass with Chris from England. 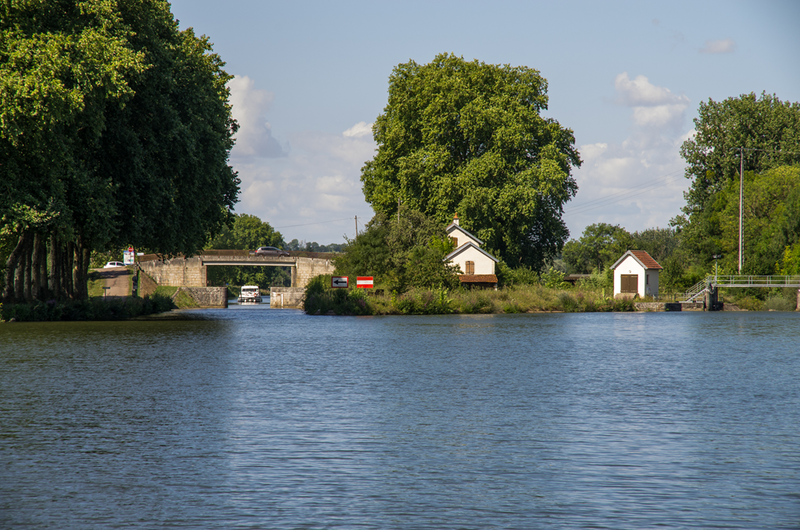 Chris has been boating the French waters for the last 9 years on his Broads cruiser and still seems to like it. And why wouldn’t he. We ourselves decide to move on a bit further. The moorings in Grey are without any shade and it has got really hot by now, well into the high 30s. We idle away the afternoon with swimming and messing and end up in the little village of Mantoche. 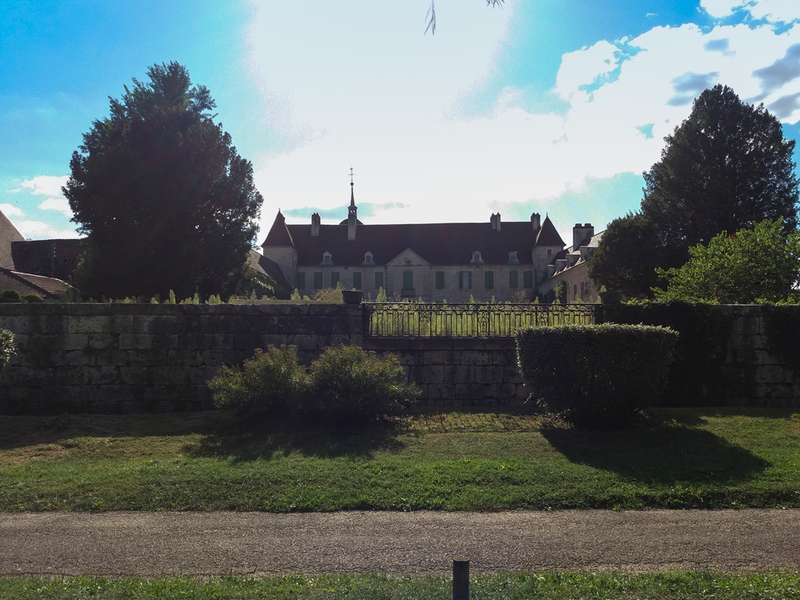 Here one can moor right in front of the Chateau. Posh. Very posh. Despite the almost Royal location there is quiet a bit of unduly unrest and boat shuffle. Till night finally falls. Brilliant bread from the friendly backer in the old mill just by the bridge. 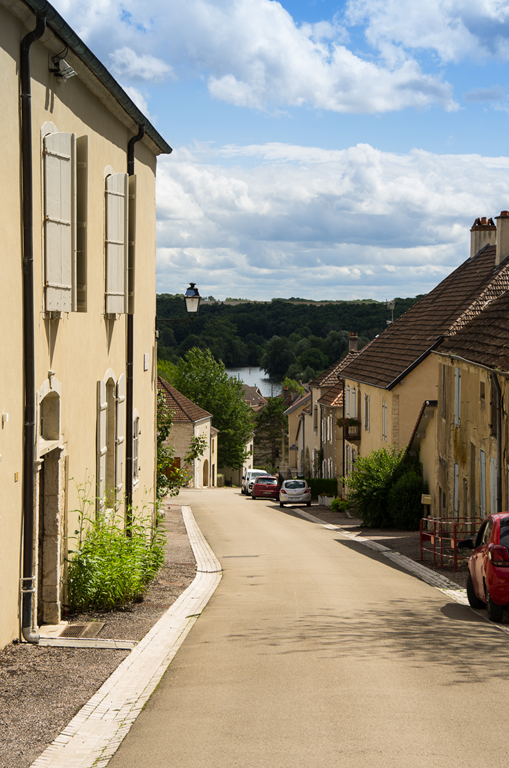 Then a bit of a stroll through Scey-sur-Saône. Nice enough. At least one unusual house. The English canal boater might have encountered his fair share of canal tunnels. 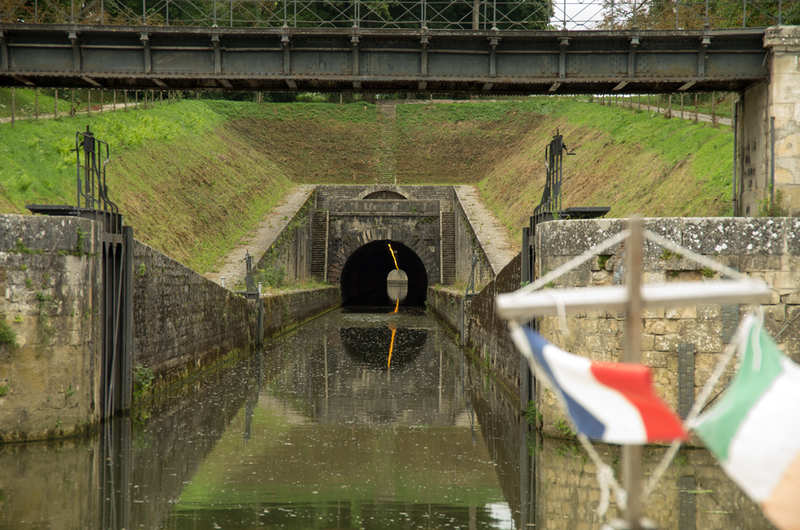 The French have taken the idea a bit further and have been building river tunnels. 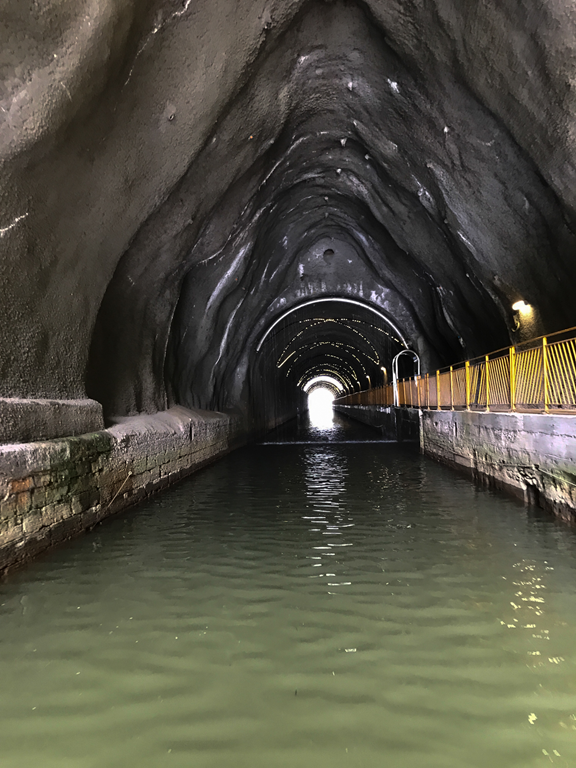 It seems a bit over the top, considering the whole tunnel and lock cut are shaving about 2 km off the rivers navigable 387km. But we will see quiet a few more river tunnels on our voyage. Soon after, we spot the first sign of commercial traffic. 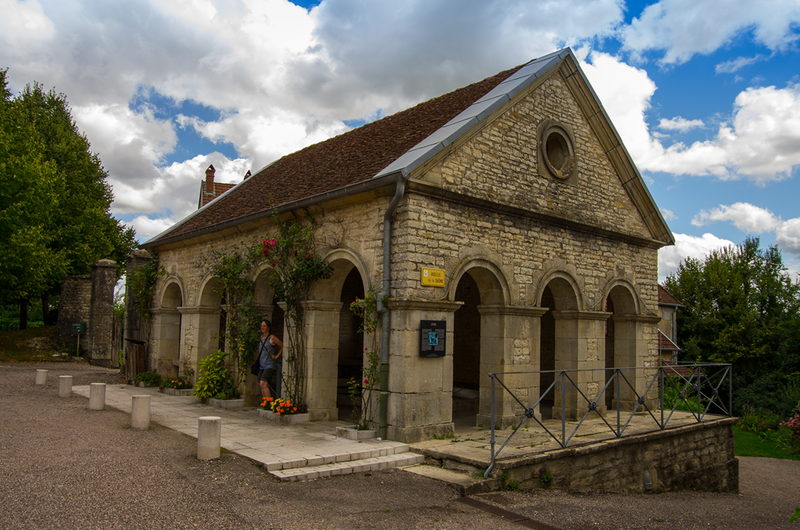 For lunch we stop at Ray-sur-Saône. 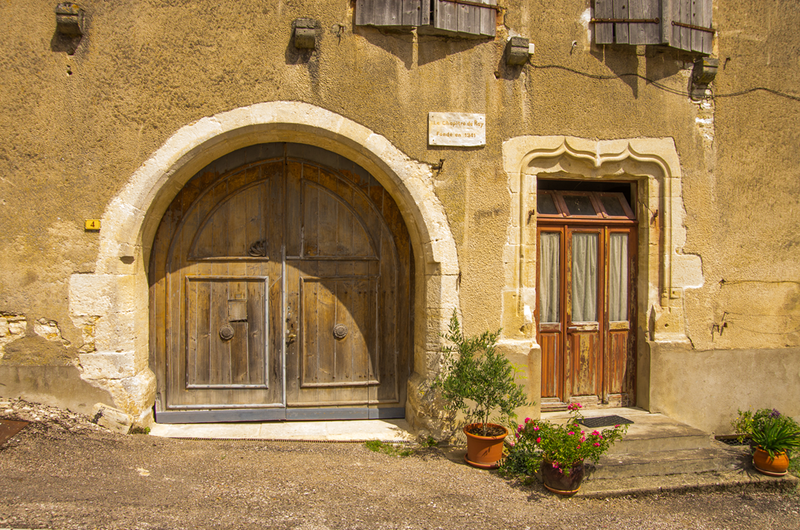 Every guide and every travel log about the Saône has been mentioning “Chez Madame Yvette” for at least the last 50 years. And that quiet sums it up already. The restaurant is a mixture between Madame’s shop, living room and storage locker. For 9€ you get a big portion of the hearty plate du jour, a glass of wine and a smile. A time capsule, not to be missed. 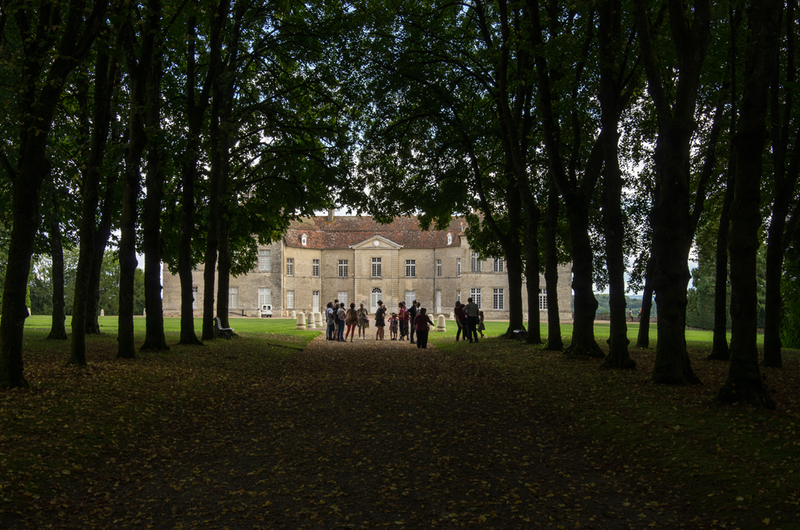 After that it is a walk up the hill to the Chateau. 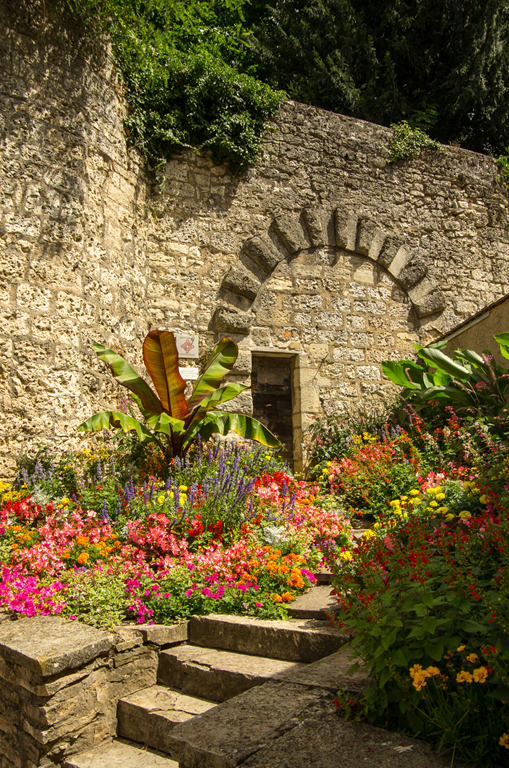 It has a very long history, having been founded in the year 800. 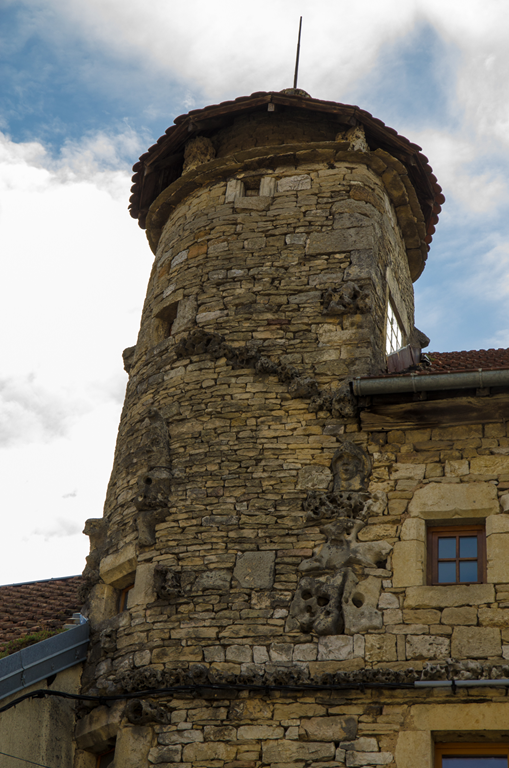 Before it was destroyed in the 16th century, it was the largest castle in the whole Franche-Comté. Today it is a bit more benign and has a garden with a view. The rest of the village isn’t too shabby either. A wash house like a Greek temple. What grandeur. Instead we find a room with a view in the middle of nowhere. BBQ, wine and a quiet night.